Here's where to watch every episode of The Transformers season 3. Mouseover or tap an episode to see where to stream it. Click or tap the play icon to stream it on the best available service. The Five Faces of Darkness (1) Sep 15, 1986 While everyone continues to rejoice in their victory, unknown assailants capture Ultra Magnus, Kup and Spike. After being told by a alien, a group of Autobots suspect the Decepticons are the culprits. But when they arrive at Charr, they find the Decepticons in no shape to pull off a kidnapping, meaning another is responsible. The Five Faces of Darkness (2) Sep 16, 1986 The Autobots make it out of Charr, but Rodimus is down and looks out. In reality, he has made a trip to the Matrix and learns the Quintessons are behind the kidnapping. After Rodimus is revived, a rescue mission is soon underway. Also, Scourge and Cyclonus finally track down a battle hungry Galvatron. The Five Faces of Darkness (3) Sep 17, 1986 The destruction of Quintessa causes the Autobots to arrive at Goo and poor Springer loses some parts. Blurr and Wheelie are stuck in a hostile place and are in need of some help. Meanwhile, the Quintessons agree to give vital energy to the Decepticons so long as the Autobots are destroyed. The Five Faces of Darkness (4) Sep 18, 1986 Galvatron learns what has been going on recently and meets up with the Quintessons. Rodimus again looks for answers, discovering the bitter history between Quintessons and Transformers. The Quintessons created the Transformers, but their creations rebelled against them. And the Quintessons are eager to exact revenge. The Five Faces of Darkness (5) Sep 19, 1986 The Constructions use the newly created Trypticon to battle Metroplex, who is still unable to transform, on Earth. Sky Lynx tries to get the needed cog for Metroplex, which is with Blurr and Wheelie, but gets into a fight of his own. The Autobots and Decepticons continue fighting on Cybertron, until the Quintessons manage to immobilize them, leaving only Spike to save the day. The Killing Jar Sep 29, 1986 The Quintessons use Wreck-Gar, Cyclonus, Ultra Magnus and Marissa as research subjects, watching how they interact. Unfortunately for all of them, the ship they are on is heading for a black hole and this unusual group will have to work together to survive. Chaos Sep 30, 1986 An alien is discovered to have a powerful weapon that fires crystals, which are taken from a creature Kup knows of, Chaos. Galvatron plans to construct his own powerful weapon on Chaos' home and several Autobots race to prevent him from using it on Cybertron. Dark Awakening Oct 1, 1986 On the run from Galvatron, Spike, Daniel and several Autobots enter a mausoleum and find a surprisingly not dead Optimus Prime. This would be cause for great excitement among Autobots. Unfortunately, however, Optimus is really under Quintesson control and is being used in a plan against his friends. Starscream's Ghost Oct 2, 1986 Octane is on the run from The Decepticons. He is forced to hide in a crypt, where the ghost of Starscream lies in wait and then takes over Cyclonus. Thief in the Night Oct 6, 1986 Octane locates the defeated Trypticon and brings him to Carbombya. There, they follow orders from Fakhaddi in order to get energon. They begin stealing landmarks around the world for him. Forever Is a Long Time Coming Oct 8, 1986 The Quintessons plan to use a portal through time to prevent the Transformers' revolt against them. Several Autobots wind up getting sent back to the fight and a robot with an important future arrives in the present. And the Quintesson time portal begins to have disastrous effects on the universe. Surprise Party Oct 9, 1986 Wheelie and Daniel want to have a party for Ultra Magnus after a recent good deed of his. However, Ultra Magnus' birthday is unknown, even to him. Wheelie and Daniel try to find out the answer from Autobot records. Unfortunately for them, Cyclonus decides to intervene. Madman's Paradise Oct 13, 1986 Daniel leaves a banquet being hosted by his parents. He and Grimlock end up discovering a Quintesson chamber and get stuck in a magical world. Carnage in C-Minor Oct 14, 1986 The Autobots and Decepticons find that the voices of three aliens (Allegra, Zebop Scandana and Basso Profundo) can make a powerful weapon. 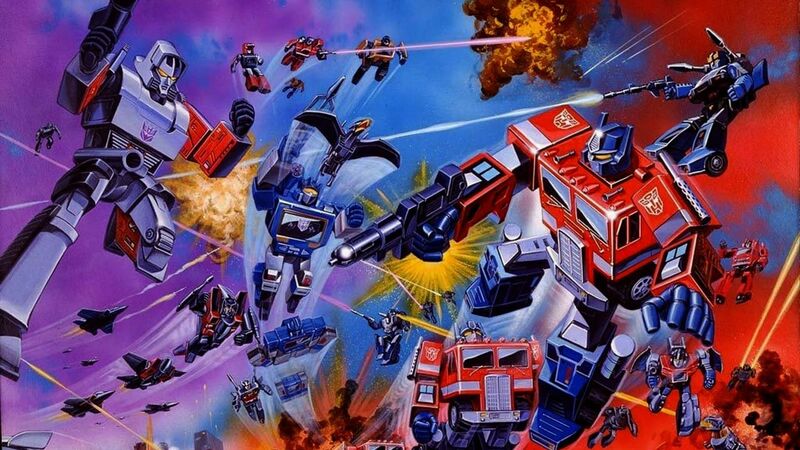 Fight or Flee Oct 15, 1986 The Decepticons attack a planet home to several Autobots and easily win as these Autobots prefer peace to fighting. Once the Autobots arrive, they try to persuade their peaceful comrades that only battling the Decepticons will solve their problems. Webworld Oct 20, 1986 Galvatron goes into therapy, but it does not exactly agree with him. Every one of the doctors' attempts at treating him fail before they consider using one last option. Cyclonus tries to stop them, however, after learning it would make the Decepticon leader an invalid. Ghost in the Machine Oct 21, 1986 Starscream, in Scourge's body, attempts to complete three assignments for the damaged Unicron in exchange for getting a new body. The Dweller in the Depths Oct 30, 1986 The Quintessons trick the Decepticons into releasing the dangerous Trans-Organics. One of them, the Dweller, begins taking control over Autobots and Decepticons alike. Nightmare Planet Oct 31, 1986 Daniel's nightmare troubles get a lot worse when the Quintessons make them real. Autobots and Predacons are forced to join forces in order to fight these nightmares. The Ultimate Weapon Nov 10, 1986 Metroplex's transformation cog is taken by Swindle and First Aid blames himself for not stopping him. Meanwhile, Galvatron threatens to use a powerful weapon. The Quintesson Journal Nov 11, 1986 Two planets are locked in a destructive war and the Autobots attempt to bring about peace. Things do not go so well, however, until a Quintesson Journal is found and provides evidence of Quintesson involvement in the war. The Big Broadcast of 2006 Nov 12, 1986 The Junkions fall victim to subliminal messages from the Quintessons, who are trying to get a journal off the Planet of Junk. This also causes the Junkions to attack Sky Lynx and Astrotrain, which brings the Autobots and Decepticons into the situation. Unfortunately, a screw up makes the Junkions send out the subliminal messages on their own, bringing about mass confusion and destruction. Only Human Nov 13, 1986 After the Autobots interfere with one of his plans, Victor Drath gets help from Ol' Snake (none other than the notorious Cobra Commander) to create artificial human bodies. Rodimus, Springer, Ultra Magnus and Arcee get caught and placed in the artificial bodies. Seemingly human, they will have to find a way to reverse what was done to them and stop Drath from using their original bodies against Autobot City. Grimlock's New Brain Nov 14, 1986 Grimlock becomes a genius after trying to stop anti-electrons (released by Scukzoid and Slizardo) from causing disruptions in the new power generator. This proves very useful to the Autobots, especially when Grimlock learns Unicron is the source of the anti-electrons. The Autobots journey to Unicron to prevent more anti-electrons from being obtained, but Galvatron and his forces are also heading that way. Money Is Everything Nov 17, 1986 Marissa Fairborne and the Technobots encounter Dirk Mannis, who possesses the dangerous Recreator. Turns out the Quintessons want the Recreator for themselves and Dirk is happy to give it to them so long as he gets paid. Marissa and the Technobots get tangled into the resulting betrayals and scheming. Call of the Primitives Nov 18, 1986 The evil Primacron plans to use an energy being named Tornadron to defeat the Transformers and help in his universal conquest. Meanwhile, the animal form Transformers leave during a battle between Autobots and Decepticons upon getting a strange signal. The signal was apparently sent by Primacron's own assistant, who believes this group of ""Primitives"" can defeat Primacron. The Burden Hardest to Bear Nov 19, 1986 Being the leader takes it toll on Rodimus and his attempt to relax gets him into a fight, in which he loses the Matrix. The Stunticons escape with it and Rodimus reverts to Hod Rod. At first, Hod Rod is perfectly fine with no longer being in charge, but he soon understands he must get the Matrix back. It will not be easy, though, as Scourge has already seized the power of the Matrix. The Face of Nijika Nov 20, 1986 A group of Autobots, Cyclonus and Quintessons become trapped within a Quadrant Lock Disc that has also kept the planet Zimojin and it's inhabitants trapped for thousands of years. To get out the Quintessons need a component belonging to Perceptor, but he has several parts taken out which are used by Katsudan to make repairs on a robot. Now in the small form, Perceptor learns the Zimojins were trapped there by the Quintessons out of fear. The Return of Optimus Prime (1) Mar 2, 1987 While testing a new ship alloy, Jessica Morgan and Gregory Swafford (who hates Transformers) stumbled upon the ship Optimus Prime was on and saved him. Some time afterward, Jessica gets hurt in a battle between Protectobots, Technobots and Terrorcons, causing her father and Gregory to plot revenge. They use Optimus to lure the Autobots into a trap, getting them infected with Hate Spores which make them go berserk. As the infection spreads, Sky Lynx seeks out a Quintesson that could bring Optimus back to life. The Return of Optimus Prime (2) Mar 3, 1987 Optimus Prime is back and leads a team to Charr to retrieve the ship alloy from Galvatron. Galvatron guides them to it's location, but they confront a couple dangers and must fend off infected Transformers. Optimus and SkyLynx are the only ones not infected and barely get away with the alloy. The alloy is used to safeguard Optimus from the Hate Plague for his battle against Rodimus as the Matrix is the key to the cure.